Posted on January 24, 2019 at 5:25 am. We begin today with WOLF PACK PRIDE! There’s an “end-of-the-quarter” tradition to celebrate this week: the Wolf Pack Lunch! It’s a free pizza party to recognize those students who embody all the best that Williamsburg has to offer. It’s also a chance for students to talk one-on-one with our administrators, and to share their thoughts and concerns about the school. Your teachers have selected honorees from every grade and every team. Those deserving students are all listed on the screen now — and should also have received an invitation from their school counselor. 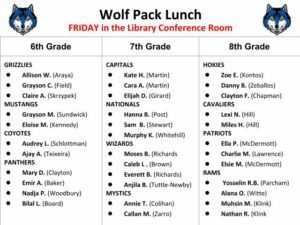 If you see your name, be sure to come to the WMS Library Conference room on FRIDAY during your grade-level lunch — for all the pizza you can eat! Please DO NOT go to the cafeteria first; but come directly to the library. We can’t have the party without you! See Ms. Mays or your TA teacher with any questions. Attention Mr. Schonfeld’s 7th grade Journalism class: today is the SECOND day of student interviews. Please report to the library during Wolf Time for your Q-and-A. Once again, the rescheduled Journalism interviews are TODAY immediately following the Morning Announcements. Calling all TAB members! This is a VERY important announcement for EVERYONE in TAB. TAB members PLEASE report to the library TODAY immediately following the Morning Announcements. The yearbook staff will be taking all of your pictures for inclusion in a special TAB section. Again, all 6th, 7th, and 8th grade TAB members should go to the library during Wolf Time. The WMS Jazz Band Club will be hosting its next “Jam Session” TODAY during ASP 1 in the Band Hall. All instruments are welcome! For more information, go to the Jazz Club page on the WMS website or contact the band leader, Mr. Wilkin. You’ll have a swingin’ good time! The Best Buddies Club is meeting this FRIDAY for fun-and-games during Wolf Time in room 108. Members and allies are invited to come make friends — and make a difference with some amazing kids. Plus, Best Buddies will be kicking-off its Hot Chocolate fundraiser — taking place every Friday morning through February. Just remind your TA teacher to sign your class up. See Ms. Rogers with any questions. Thanks, Buddy!! The Williamsburg SCA — our Student Council Association — will be meeting this FRIDAY during Wolf Time in room 215. All officers and representatives are expected to attend. See Mr. Taggert or Mr. Peacock for more information.